1 of 2 In medium-size bowl, whisk eggs, milk, almond extract, cornstarch, flour, oil, sugar, baking powder, salt and allspice. Refrigerate 20 minutes. Stir. 2 of 2 Heat an 8-inch nonstick skillet over medium-high heat until hot. With ladle or 1/4-cup measure, add 2 tablespoons batter to skillet. Tilt and rotate pan to coat. Cook 30 seconds or until crepe is browned on bottom and dry on edge. Lift with a silicone spatula and flip over. Cook 5 seconds, then transfer to a sheet of parchment or waxed paper. Repeat with remaining batter for about 18 total, stacking crepes with paper in between. 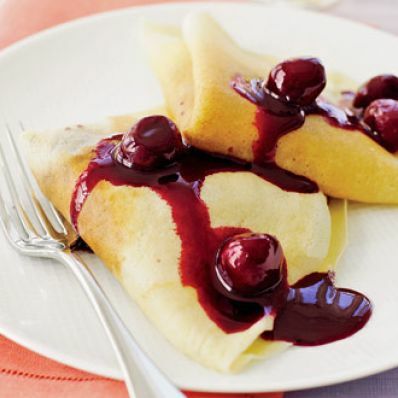 Crepes can be wrapped and frozen for up to 1 month. 1 of 2 In a saucepan, blend juice, cornstarch and sugar. Cook over medium-high heat for 6 minutes or until thickened. Stir in cherries; heat 5 minutes. If too thin, combine 2 more teaspoons cornstarch and 1 tablespoon water. Stir into pan; cook until thickened. 2 of 2 Place one crepe flat on a plate. Spoon about 2 tablespoons filling on one quarter. Fold crepe over; then fold again to form fan shape. Repeat with remaining crepes. Drizzle with additional sauce. Per Serving: 191 kcal cal., 146 mg sodium, 2 g fiber, 1 g sat. fat, 54 mg chol., 3 g Fat, total, 37 g carb., 4 g pro.